The presence or absence of soft and hard tissue between adjacent implants and between implant and teeth is of great concern in implant dentistry. In the last years the use of dental implants with new microstructure and macrostructure design seems to improve tissues’ stability around implant. On the other side a lot of different surgical techniques has been proposed to ricreate good quality and quantity of soft and hard tissue. The author presents his experience in the field of regenerative surgery in order to obtain good and stable results in particular in the aesthetic zones. The use of different barriers and different biomaterials will be explicated in correlation with the different surgical technique. Dr. Alessandro Rossi has graduated in Odonto-Stomatology and Dental Prosthodontics, at the University of Milan, Italy with Prof. Matteo Chiapasco. From 1997: Tutor of the Department of Oral Surgery and Implantology at the San Paolo Hospital, University of Milan (Head Prof. M. Chiapasco). From 1997: Visiting Professor in Dental Implant Rehabilitation at the School of Odonto-Stomatology at the University of Milan. Lecturer in post-graduate courses of Oral Surgery and Implant-Prosthodontic - Dental Clinic University of the study of Milano. 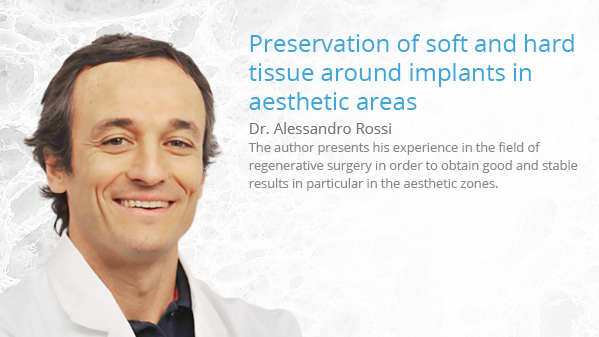 In 2007 he obtained the Specialty in Oral Surgery at the University of Milan. Active Member of the Italian Society of Oral Surgery and Implantology (SICOI). Active member of PEERS, Active Member of the Italian Society of Osseointegration (SIO). ITI fellow from 2006 and IADR member. His clinical activity is focused on oral surgery, with particular attention to implant-prosthetic and preprosthetic surgery (post-estractive implants, immediate loading, alveolar ridges reconstructions using intraoral bone grafts and/or alloplastic material). He is the author or co-author of approximately 40 papers published in international and in Italian Journals. He is co-author of some textbooks related to oral and maxillofacial surgery, some of them published in English and/or translated in several other languages (Italian, Spanish, Portuguese).